A simple, but effective, black & white version of The Crow. The flashbacks to Eric's life have been left in color. A few seconds of film have been cut overall, and some audio, including all of Sarah's voice-over narration. I love The Crow, but always thought it would be cool to see in black & white. I think the Gothic nature of the character fits in well with a shadowy monochrome film noir look. 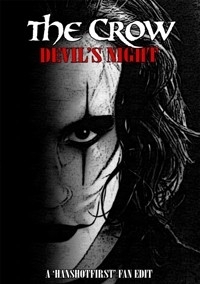 I was also inspired but the B&W of the original comic, and an interview in the Blu-ray extras in which Brandon Lee states how much he would have loved to make the Crow a B&W film. There seems to be a graininess to the Blu-ray that I have made this edit with. I don't think it's the highest quality HD transfer, and the film probably needs a good HD restoration. Then again, it might be that the film was just made on very grainy film stock, which I think might be the case. I personally don't mind the look of it, as I think it adds to the gritty feel of the whole thing. Special thanks to MWRK for his great cover art. Black & White effect to the entire film, minus the flashback scenes. Removed a few seconds from a hot dog vendor scene. Removed Top Dollar impaled on the statue. Seemed more a reduction of the original dark colour scheme to pure black n white. Video - I found the majority of this way too black. Details were often lost in the shadows. The crow often disappeared while flying, the equivalent of the golf ball against white clouds. A touch of brightening might have helped. During colour flashback sequences, details and clarity returned. Audio - From time to time, I thought I noticed sync issues. Reference 33" region. Lips seemed to lag words. This was when I played the 4 GB mp4 version straight from an external HD into the USB port of a BluRay. When I viewed the same through the computer, everything was fine. Could be my set-up, or a glitch owing to USB conversion. Opening with Brandon Lee was a poignant touch, and a clear statement of what HanShot had in mind. Also much closer to the original series of comics by James O'Barr. Watched this with two other friends - we all liked it. This is really a great fan edit because of the intentions and motivations. The story was every bit as interesting and enjoyable in black & white format. The video/audio editing was superb because so little was done, and the quality of the copy I watched was also superb. One of my friends didn't like that the guy getting impaled was removed, however it was still clear that he died from the fall. This is definitely worth burning to disk, and I'll definitely bring attention to this edit whenever Brandon Lee or The Crow is discussed in the future. I didn't think that any of the scenes were "Too dark" (in lighting terms), I think that it was visually acceptable and even preferred given the nature of this film. Overall a really great fan edit! Big fan of The Crow, here. When I was a teenager, it was hands-down my favorite movie, so I have seen it many, many times. And this is a terrific version. It's not a huge departure from the original because it doesn't need to be; it's just another way to watch an already great movie. Does the black and white work? Of course it does! The comic was in black and white, and there wasn't a whole lot of color to begin with outside of the flashback scenes. And in stark contrast to the majority of the film's (now complete) lack of color, boy do those scenes pop! The effect of the harlequin makeup is now much more dramatic as well; without Eric's skin tone peeking through, the "mask" he wears looks even more threatening. I did find that the picture was occasionally TOO dark, with the shadows bleeding over into areas of the frame that were previously visible. This is especially noticeable in establishing shots featuring dark rooms and dimly lit city streets, of which there are many. Occasionally lowering the contrast for even just sections of the frame would have helped a lot. Otherwise, lack of color is a welcome and appropriate change, and the moment where the color returns to Eric's world was beautifully done. The few cuts were well chosen and gracefully executed, although I would have transcribed Sarah's opening voice-over to text over the opening shot. It's short and simple, and it is rather important as it explains the central conceit of the story. I watched the edit with a friend who had never seen the movie, and, lacking this information, I did have to explain to him the mythology behind what was going on. We both really enjoyed watching it, though.